Update 24 May at 5:20pm : The predicted peak hour is over. But from online feedback, not many meteors seen. So do not have very high hopes of seeing many meteors in Singapore even if the sky is clear. Astronomers are predicting that there will be new meteor shower visible today (24 May). Its name is Camelopardalids as the meteors will seem to radiate from the constellation Camelopardalis (aka Giraffe constellation). (1) The sky is clear and dark enough. (2) Observer is patient enough to keep looking at the northern sky from sunset of Saturday 24 May. The peak of the meteor is expected to be from 2pm - 4pm Singapore time today (UT+8). So the best location to see it is in countries high up above the equator and experiencing night time during this time period - e.g. North America and Canada. From Singapore, most of Camelopardalis will be *just below* the horizon from sunset to sunrise. You can find it in free planetarium apps like Sky Map (Android) and Planets (iOS). But just because you cannot see the constellation does not necessary means you will not see any meteors! Meteors "shoot out" from an apparent radiant point. In this case, shooting out in all directions from the north near horizon across the rest of the sky. Parts of this rest of the sky is still dark and visible from Singapore and that's why it is still possible to see some of them here. Not as much and as long as North America but not totally zero either. The peak of this activity is from 2pm - 4pm Singapore local time. Meteors do not suddenly disappear from potentially hundreds to zero immediately after the peak hour. No doubt the rate will decrease from peak hour making the possibility of seeing them lower but not totally impossible in the few hours before or after peak hour. Moreover, meteor peak hour predictions may not be 100% accurate. So it may actually peak earlier or later. The fact that this is a brand new meteor seen for the first time adds to the chance of peak hour prediction errors. So the strategy to view them in Singapore is to observe at the night closest to this peak hour as possible. That would be tonight 24 May. Especially just shortly after sunset when the sky is dark enough. - Go to dark park with open skies, i.e. away from nearby glaring lights especially from the north. - Go up high to minimise ground level local light pollution. e.g. sky parks and roof top gardens. If can't leave your house and have a good enough view of the northern sky, try to switch off all the lights in the house and observe! At least your eyes will be able to dark adapt better then being outdoors with bright lights shining into your eyes. If you are able to stay awake till Moon rise at about 3:53am you may see something that is quite extraordinary through a telescope - meteor shower visible in the unlit side of the thin crescent Moon! You may see them as sudden but tiny flashes. For those who are into photography, this may be interesting opportunity to shoot star trails with meteors radiating across them. (1) Camelopardalids is & *predicted* to have a rate of hundreds of meteors per hour. Some even say 1000! Meteor rate predictions is not exact science. So set you expectation low so even if you see a couple over a few hours, you can be quite contented. (2) All astronomical events are totally dependent on the weather. Plan to spend your Saturday evenings in more enjoyable ways in advance in case the weather is not promising. (3) If portions of the sky is clear enough and you have access to a telescope or binoculars, whey not observe the stars and the planets while hunting for meteors? Mars, Saturn, Jupiter appear early in the evening and Venus and Moon couple of hours before sunrise. (4) Make use of the time to catch up with your family and friends. You can still talk to them face to face or or on the phone while staring at the northern sky. Or listen to your favourite music, recorded lecture or audio book which you can't seems to find the time to listen to. WEATHER PERMITTING, my friends and I *MAY* be going to Bishan Park to observe this meteor and/or conduct a free public stargazing session tonight. This will most probably be a very last minute decision so stay tuned to my blog, twitter or Singapore Sidewalk Astronomy facebook page. Wishing for clear skies tonight and good luck meteor hunting! We may the first human species to see this meteor shower for the very first time in history! The best time to observe/photograph Saturn this year is this weekend 10/11 May 2014. Saturn will be in opposition - Saturn, Earth, Sun forming an imaginary straight line with Earth in the middle. Thus, the distance between Earth and Saturn will be short and this means Saturn will look bigger in the same size telescope compared to other days in 2014! If you miss observing Saturn this weekend, do not worry. It will not suddenly shrink into a very small apparent size overnight. It will very gradually become smaller. So you can continue to observe/photograph it for many more weeks on any clear enough night. 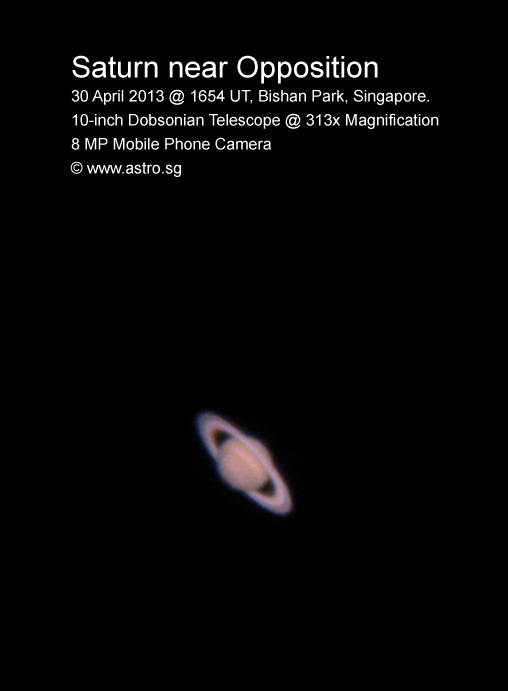 How to find Saturn in Singapore? (1) Use a free smart phone app - Sky Map (Google Android) or Planets (Apple iOS). (2) Use the most sophisticated computer in the whole universe - your vision system and brain! Look at the following illustration of the sky at 8pm facing East (east-southeast to be exact). Step 1 - Locate Mars and Spice in the sky. They look like a pair of bright "stars" in the sky. Mars look like a red or bright orangy "star". Spica, a white star. Step 2 - From Mars to Spica, imagine and extend the same distance about 2 times. You should see another bright "star" nearby - Saturn! You can use your fingertips to do this rough estimation of distance. Weather permitting, my friends and I will be deploying our telescopes for free public viewing at Bishan Park McDonald's. From 7:45pm till late. So come see Saturn (and Moon, Jupiter, Mars too!). You may bring your Mother along and let her enjoy a very special Mother's Day weekend! The next public stargazing talk is titled "Spectacular Saturn". Discover the fascinating facts about the Lord of the Rings and learn how to observe it with your own eyes right here in Singapore! Weather permitting, live stargazing during/after the talk at the open grounds outside the library. Come see Moon, Jupiter, Mars, Saturn, star clusters and nebula (star cloud) through telescopes! Feel free to join in the fun with your family and friends!